1803?-1897. Deposited in the Wall collection, Alexander Turnbull Library, New Zealand. What is The Halfway House? The Halfway House is an old name for Irish, Welsh and English accommodation houses or public inns. These former coaching stops are located at strategic travelling points, usually halfway between two destinations by horse and sometimes on a border between counties. The name came to New Zealand with the 1840 mass immigration of European people. The first building known as the Halfway House in Glenside (then called "The Halfway") was built in c1840-1841 and occupied by the Wall family. It was built halfway between Wellington and Porirua. It no longer exists. However, there is a later built building known as the Halfway House in Glenside. The most recent building known as the Halfway House in Glenside is located at 246 Middleton Road, Glenside, behind Twigland Gardeners World on the Glenside Reserve. Wellington City Council own it. The existing building, built c1885 and known as the Halfway House, was privately owned until 1951. In 1951 Victoria College (now Victoria University) encroached onto the Wellington Town Belt. 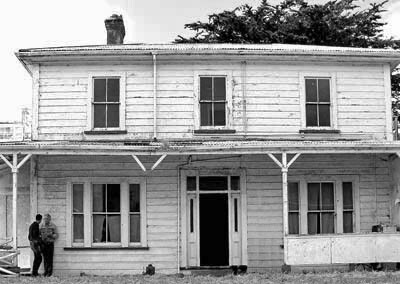 Wellington City Council purchased the the Halfway House and associated land with Crown funds paid in compensation for the encroachment. The house was rented out until about c1997 when the last tenant died. It has been unoccupied since then. Since 1951, the Glenside Progressive Assn. Inc. has been concerned about the way the Wellington City Council has been managing the Glenside Reserve and Halfway House and has been raising these concerns with the Wellington City Council. These concerns intensified during 2001-2011. This was because the house was not tenanted or being looked after. At the same time, the Wellington City Council was consulting on the Northern Growth Management Framework and the Assn. could see the potential for the Glenside Reserve and Halfway House to have a more prominent place in the community. During these years the Assn. made many submissions and representations to the City Council and Councillors in an effort to get the house renovated for public use. Renovations commenced in 2012 and were completed in 2017. The Glenside community vision is to work with Council in managing the future of the house, to develop the grounds as a Victorian farm garden using heritage plants and flowers, and to promote the house and grounds as an attractive and interesting place for visitors. What is the heritage status of the Halfway House? The Halfway House is listed on the Wellington District Plan as an historic site. In 2010 the Historic Places Trust received a paper from the Glenside Progressive Assn. Inc. to have the building assessed for a Historic Category rating. The Trust advised it was unable to progress the Halfway House nomination for registration due to its current resourcing levels and that the nomination will remain on file in the event circumstances change. Information provided by the Association has been recorded in the Historic Paces Trust register database and will be kept a part of the Historic Places Trust records. What is happening with the Halfway House? 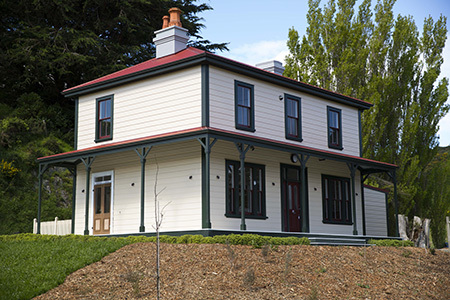 In 2012 the Wellington City Council began restoration work on the Halfway House. There was a set-back in October 2015. Just days before renovations were due to be signed off, a crimped fire sprinkler pipe in the ceiling burst free and for three days water flooded the house. In the last week of February 2017, renovations recommenced. The house was officially opened on 29 October, 2017. Wellington City Council sought registrations of interest from people interested in leasing the house. It is currently occupied by the leaders of Challenge 2000, a youth development initiative. The downstairs front rooms remain available for community use and are managed by the Glenside Progressive Assn. Inc.
What is happening with the grounds? The grounds are managed in partnership by the Halfway House Heritage Gardeners, who are creating an early settler Victorian farm garden, and the Wellington City Council. What does Wellington City Council propose for the house? Retain ownership of the building but find a suitable long-term use for it. Carry out essential maintenance and work to make the house safe. Lease the building for public good (recreation, leisure, community, cultural or education). Develop a car-park (which has since been completed). Recreate a garden in keeping with heritage and character and place historic interpretation panels. Why is there a Halfway House in Glenside? Glenside was known as The Halfway from c1840-1928. The name was given to the area because it was located on the main route halfway between Wellington and Porirua. Early settlers Anthony and Susannah Wall settled in the area in the spring of 1841 and provided accommodation for travelers passing by. Their home is believed to have been located off present day Glenside Road and was known as the Halfway House. It was the first Halfway House in the locality. After the Wall's left the area, history records six different proprietors operating a Halfway House in the Halfway (Glenside) up until c1900. By 1900 the railway line had opened taking travelers by steam train direct to towns, by-passing the former horse and coach route. Where was the first Halfway House located? The Wall family lived at The Halfway from 1841-1849. There are different opinions about the location of the Wall’s house. The page 'Halfway House Location' on this website explains the details. What do we know of the current Halfway House in Glenside? Writers have different opinions about whether the Halfway House on the Glenside Reserve was originally used for a Halfway House business or was a private residence for Alexander Brown and his wife Margaret. What people do agree is that Alexander “Sandy” Brown built it in about 1885 and that he was a licensee who operated a Halfway House in The Halfway, now called Glenside. Brown's descendants say that Alexander operated a hostelry (public inn and accommodation) and way station (place for checking goods in transit) for stage coaches passing along the main road. 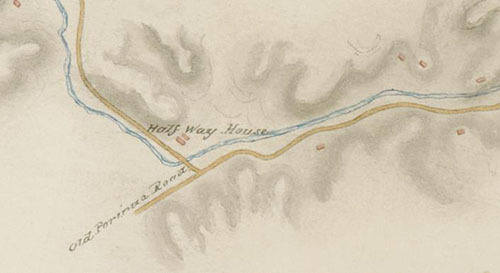 Map showing the Halfway House on the Porirua Road, north of Johnsonville. This was drawn when the Porirua Road was being upgraded, hence the reference to the "old" part of the road. The existing c1885 Halfway House is located very close to where one of the Halfway House's was located in 1849. A map drawn by Thomas Henry Fitzgerald in 1849 for Captain A H Russell marks the location of a building called The Halfway House (see map above). Today this location is about where Twigland Gardeners World is, or perhaps it was behind Twigland's, where the ground rises at the base of the hill. 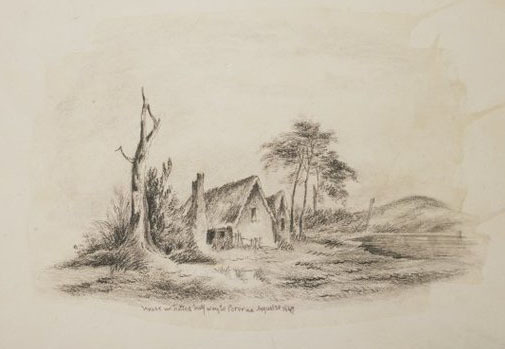 In 1849 the Wall's sold out and moved to Paremata, now known as Papakowhai. The Halfway House was then managed by John McKain. It is possible that Mr McKain relocated the operation of his business from the bottom of the Accommodation Road over to this 1849 site. (In the old days, it was the person who was licenced, not the premises). The owner of a private home opposite Twigland Gardener's World found many old horseshoes in her garden, suggesting that at a later time there may have been a blacksmith located opposite the Halfway House marked on Mr Fitzgerald's map.